To a C11 tower and nave, mid-C12 aisles were added. These were extended to the east in the C13 as part of a new chancel, to which a C15 chantry was added. This development was obscured in the C19, when the eastern parts were rebuilt; the aisles followed in 1908. There is C14 and C15 glass and a pre-Conquest stone coffin lid. The church (which was formerly dedicated to St Peter and St Paul) is mentioned in Domesday Book (9,11) and its much altered oldest parts probably date from around that time. They consist primarily of an aisleless nave, of which the north wall is only 2 ft thick. This nave was only half as long as the present one and above the north arcade on the aisle side is an area of herringbone masonry. The low tower probably dates from the same time, though only the proportions and the original lack of buttressing (these were added in the C15) suggest this. Aisles were added around 1150, possibly when the manor returned to episcopal hands after a brief period of alienation, as the arcades resemble those at Icklesham, another episcopal manor. The round heads have two slightly chamfered orders and both piers are round with shallow capitals and water-holding bases. Only the capitals differ – the north one is slightly deeper and has scallops, whilst that opposite has foliage, almost an early form of stiff leaf. The last has been dated to 1180 (BE p415), but the form of the arches, bearing in mind that the capitals were probably last to be carved, makes the earlier date likely. As well as Icklesham, this work has been linked to other churches in the area and it has been suggested that the link was Battle abbey (www.crsbi.ac.uk retrieved on 1/4/2013). The aisles as built were narrower and lower than today, as the Burrell Collection drawing of c1785 shows, though the detail shown there is later. Corbels for the original roof are visible above the north arcade. The relationship between the aisles and the tower is hard to discern. The tower arch is too altered to be reliable – its pointed head dates from 1878 – though the square chamfered jambs could be mid-C12. On the north and south sides of the tower are plain round-headed arches. Before 1907 these were blocked (VCH 9 p122) but they look old and suggest that the aisles were intended from the start to extend either side of the tower, as the north one did before 1907 and both do today. They are simpler than the arcades, but that may be because they were inserted in the existing tower. 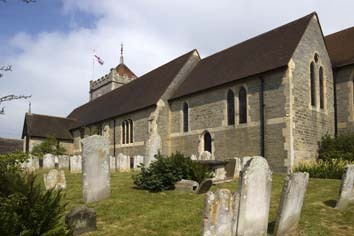 The nave was extended by a bay to the east in the later C13. The new arches each side have heads with two hollow chamfers, the inner ones on shafts, and square chamfered responds with stops. The semi-octagonal shaft on the south east respond rests on a head-corbel; the equivalent to the north is round with a tapered base. 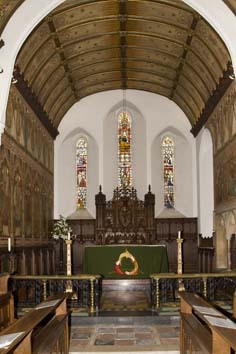 When the nave was extended, the chancel was rebuilt. The Burrell drawing shows tall lancets, including three east ones. It was narrower than the nave, for the C15 arch of the north chapel, which when built opened into it, projects beyond the arches to its west. The church as it stood by 1300 changed little until the C15. The only identifiable C14 change is a pair of ogee-headed bell-openings on the north side of the tower; though renewed, the Burrell drawing shows similar ones. 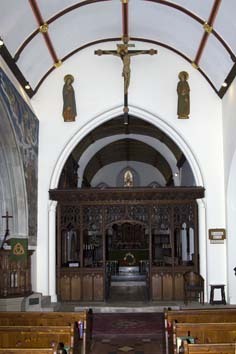 In the C15 changes resumed, starting with the chancel arch, which was moved further east in 1878. Its head has two hollow-chamfered orders and the shafts on the responds, though renewed, are trustworthy. The Burrell drawing shows square-headed aisle windows and a north doorway that now opens into a vestry. Modifications to the tower included diagonal buttresses, a moulded west doorway, a large window (this now has C19 tracery) and battlements. The previous tower arch which had a pointed head (3 pl 8), may have dated from this time. Perhaps surprisingly, no attempt was made to heighten the tower or to add a clerestory to the nave, which was always dark. 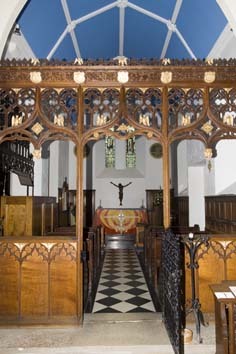 The narrower eastern part of the north aisle with big windows of renewed panelled tracery, of which the eastern one now opens into the organ-chamber, was the Batisford chantry, founded about 1453 (3 p80), though the fabric looks earlier C15. 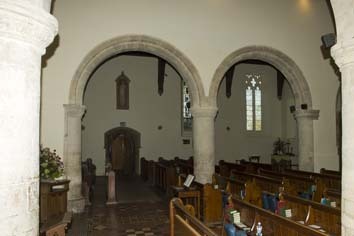 It then stood north of the chancel with an arch that is now the eastern one of the north arcade and has semi-octagonal responds and a moulded head. That into the aisle also survives with a moulded head and no abaci. A photograph of shortly before 1878 (VCH 9 opp p121) shows a smaller south chapel with C15 detail, but no trace is left. Nave and chancel had plastered, coved roofs (SNQ 16 (Nov 1964) pp130-31) and though the present ones are C19, they follow the old form. Probably in the C17 or C18, galleries were inserted in both aisles. The Burrell and Sharpe Collection (1797) drawings show the dormers and an outside stair to the south led to a manorial pew. The effect was a picturesque jumble, unchanged until W Butterfield restored the church in 1877-79 (BN 36 p164) using an unattractive grey stone. He dismantled the chancel, added further east bays each side of the nave and reset the former chancel arch. The C15 arch to the north chapel became the easternmost arch of the nave arcade, whilst to the south are two new smaller ones. The new chancel has lancets like its predecessor, with a south chapel and a north vestry and organ chamber. The tracery of the west window of the tower and the present head of the tower arch date from this time. The south aisle was rebuilt wider, though Butterfield kept the C15 form of the previous windows. The north aisle was unchanged, though doubtless renovated. Butterfield did more work to the tower in 1892 (CDK 1892 pt 2 p148). This may have included a slight increase in height as Meads stated. T Garratt (BN 63 p95) was also involved and designed many fittings the next year (see below), which were made by H Hems of Exeter (BN 64 p62). However, only in 1907 was it decided to rebuild the north aisle as wide as the south one to designs by W Tapper (CDG 170 p27) and to add an organ-chamber. His aisle has square windows with mainly reticulated tracery and as before extends north of the tower. Tapper extended Butterfield’s south aisle in the same way and re-opened the side-arches. In all, the work cost £4500 (BN 94 p381), which was more than the whole of Butterfield’s restoration. Choir stalls, reredos and lectern: Designed by T Garratt and made by Hems, c1895. Font: C19 octagonal, with an arcaded bowl of dark marble, standing on a high base with two shafts each side and said to be an accurate copy of its predecessor (1 p45). Nicholas Antram suggests it could be by Butterfield (BE(E) p121). 1. (North aisle window) Assemblage of C14 and C15 pieces, taken from the church in 1774, presented to Horace Walpole for Strawberry Hill and returned in 1921 (JSG 19 p311), when it was arranged by Kempe and Co. Recognisable are St Laurence with a gridiron, and St Andrew with his cross. Walpole believed that the figures included King Henry III and his wife (Friedman p235), but the date of the glass alone makes this unlikely. 2. (East lancets) Clayton and Bell, 1881 (CDK 1880 pt 2 p160). 3. (South aisle, west window) Clayton and Bell, 1881 (www.stainedglassrecords.org retrieved on 4/2/2013). 4. (North chapel east window) Clayton and Bell, 1888 (CDK 1888 pt 2 p138). 5. (West window) Burlison and Grylls, 1891 (www.stainedglassrecords.org retrieved on 4/2/2013). 6. (South east chancel window) J Powell and Sons, 1892, with angels (Order book). Designed by C Hardgrave (Hadley list). 7. (North aisle, east window, W B Reynolds, St Nicholas, 1908 (www.stainedglassrecords.org retrieved on 4/2/2013). 8. (south aisle, first and second windows) Heaton, Butler and Bayne, 1921 and 1917 (ibid). These may be identical with the glass, said to be of unknown date and position by S Bayne (p126). 9. (North chapel, north window) P W Cole, 1922 (ibid). 11. (South chancel, second window) M Lawrence, 1996 (artist’s website). Single light of St Cecilia. 1. (Under the tower) Small pre-Conquest stone coffin-lid, decorated with interlace and animals. Found in 1878 under the nave and initially dated to the C8 (2 p154), the C10 or earlier C11 are now preferred (Tweddle (ed) p123), though the pattern of the interlace was by then outdated. It has parallels with manuscripts of the period and the stone is probably local, though there is nothing else like it in the south east. 2. (Under tower) C13 tombstone, carved with floreated cross. 1. (Chancel walls) W G Rich, 1893 (BE(E) ibid). 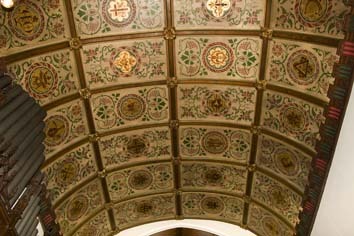 Though the colouring inclines to the drab, the designs show an awareness of contemporary painting, especially the band of angels on the upper walls. 2. (Nave north east bay) Four saints by A Sorrell, 1951 (1 p28), shaped to fit the arch. Rood: By M Travers, 1946 (Warrener and Yelton p321). Screen: Designed by Garratt and made by Hems. Sedilia: C19 triple. Alabaster with carved spandrels.